2018 Update: We don’t currently accept unsolicited guest posts on Copyblogger, although we do sometimes commission one from one of our Certified Content Marketers. But stay tuned, because content strategies evolve, and perhaps we’ll open guest posting up again in the future. It’s no secret we accept articles from others here at Copyblogger. In fact, we’re always eager to feature smart new voices with something relevant to say to you all. But… we’ve never had any published guidelines. So I asked Sonia Simone to consider what those guidelines should be. When you think about it, what we’ve come up with is great advice for submitting an article anywhere. So, whether you’re thinking of submitting something to us or not, go check out Sonia’s What Makes a Great Copyblogger Guest Post. We’re looking forward to all those fresh new voices in the new year. Oh, perfect. I really appreciate Ms. Simone’s efforts. Sometimes we’re intimidated by “the big guys,” but perhaps we can contribute to the conversations. Thank you for the guidelines. They will be very useful for guest posting across many different sites. Useful, relevant and well written…sounds like the guidelines for any publication – not just blogs. Problem is, sometimes the obvious combination of the three can be so elusive (as I’ve spent the better part of my day struggling with writer’s block). 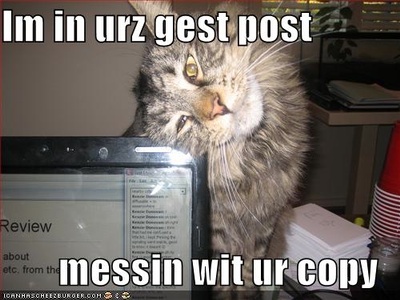 A good LOLcat makes every post better. It just shows that you and I were on some secret wavelength thing. I have an embarrassing addiction to LOLcats. If I could get away with illustrating every post I write with one, I would. I’ve only done one guest post in my career. I think having a guest post on CB is the highest of the land. They passes the A.R.T. test (accurate, relevant, timely). Actually, they also passes the “insight” and “actionable” test too. If there’s one thing I value about guest posts on CopyBlogger .. it’s, er, … value. I’ll maybe have to hit you up, Brian. I’m not sure if I’m up to the high calibre of writing on here… but, I might be willing to give it a shot. Yea its about time for reader to make a good post but can we make a blogpost on this site or what?! I think some of the readers of this blog will write some greate articles so promoting guest posting on this blog is a very good ideia. I’m glad copyblogger is taking guest posts! Why? Because yesterday I went on a post reading binge around here, and when I came back to my senses I’d just finished writing an article which may just suit the guest posting bill. I would surely love hearing your thoughts on this piece. To this effect, I just introduced myself from the official contact form. However, there was no follow-up message after the contact was submitted? I’m not 100% sure you got the message (hence this back-up comment), so I’d like to recommend adding a confirmation blurb to that contact form.